Maintaining and restoring ecological connectivity is a primary conservation need and the most frequently recommended climate adaptation strategy for biodiversity conservation. And yet, little guidance exists regarding where and how to connect fragmented habitats to facilitate climate-driven shifts in species ranges, or how to anticipate and address climate impacts to existing habitat corridors. 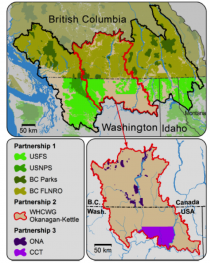 This project helps address that need by engaging science-management partnerships to inform the decision-making of land and wildlife managers tasked with maintaining connected, resilient ecosystems in the transboundary region of British Columbia and Washington State – an important area for wildlife, but one that faces significant technical, institutional, and political barriers to effective connectivity and climate adaptation planning. These partnerships include scientists from the Climate Impacts Group (CIG) and the Pacific Climate Impacts Consortium (PCIC), and managers from agencies, tribes and bands, and organizations representing diverse goals and scales of management. Products of this effort will include partnership-specific climate-connectivity conservation plans and associated maps and data; increased climate adaptation and connectivity planning capacity for project participants; and identification of information and policy gaps to guide future research and planning. Figure 1. Partnership 1. US Forest Service, US National Park Service, BC Parks, and BC Forests, Lands, and Natural Resource Operations; Partnership 2. 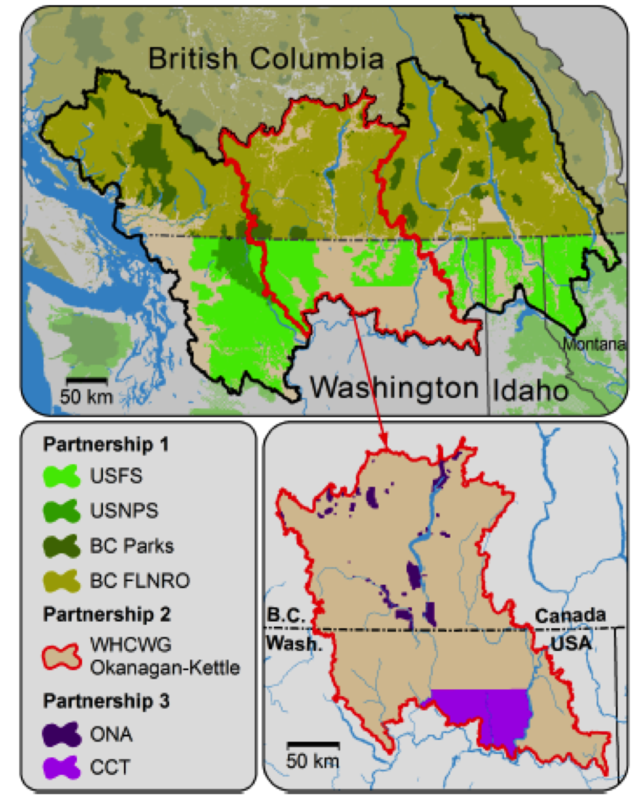 The Washington Wildlife Habitat Connectivity Working Group and BC partners; Partnership 3. Okanagan Nation Alliance (ONA) and Colville Confederated Tribes (CCT), including reservation lands (shown) as well as traditional territories / usual and accustomed areas. 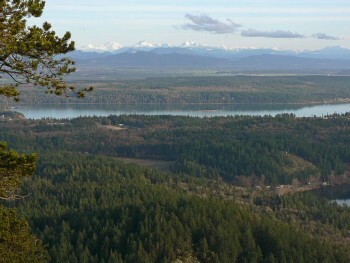 Northwest Climate Science Center, North Pacific Landscape Conservation Cooperative, Great Northern Landscape Conservation Cooperative, Wilburforce Foundation. In-kind staff time contributions from participating agencies, organizations, and First Nations.